We’re pretty lucky in Australia - tradespeople undergo extensive training, and work to some of the highest standards in the world. Most of the tradies you meet will do a fantastic job and give you outstanding service and value for money. As with all professions though, it’s still worth knowing how to spot a bad egg – and what you can do both to make tradespeoples’ jobs easier, and to save yourself money. What makes a good tradie? Everyone’s going to need the services of a tradesperson at some point, and if you’re building or renovating you’ll likely end up with an army of them all through the house. Skills and qualifications – there’s no substitute for experience and training if you’re after a high standard of quality and workmanship. Punctuality and commitment – the best tradespeople will keep disruption to a minimum by always turning up on time and finishing the job as soon as possible. Attitude and professionalism – respect and personal responsibility are as important in construction trades as they are anywhere. References - a proven track record is a strong assurance. 1. Get at least three quotes – The more quotes you get the better. We've got an easy to use form on the side of this page which you can fill in directly to get quotes Australia-wide from Service Central. All of their tradespeople are fully licensed and carefully vetted. There are dozens of trades directories and online quote request services around these days. If you're going to use one we'd strongly recommend you choose carefully. In many cases the cost of the service will be quietly added to your quote - and there's no guarantee that tradespeople will be licensed or qualified. 2. Get a written quote – When you're requesting quotes, ask for a breakdown of the costs and use your head to decide who’s best. Before any work starts, make sure you get a written quote (i.e. a contract) specifically outlining what you need done, and when payment’s due. Different states have different legal requirements about how much you need to spend before a detailed contract is necessary - but there's no reason you can't insist on it. For most of us, spending thousands of dollars is more than enough reason to be careful. 3. Choose a local tradie – For smaller ad-hoc jobs, it makes far better sense to look for tradespeople who normally service your area. You won’t be paying through the nose for travelling costs, they’ll know where to pick up supplies, and they’ll also know all the local council quirks and regulations. Get a genuine recommendation from someone you trust. Ask friends or colleagues, or see if anyone on Facebook can recommend someone. If you’re having a bigger job done, chances are the builder you’re dealing with already has a team of tradespeople they trust and work well with too. 5. Ask to see qualifications – Asking to see qualifications or licenses might feel awkward, but that shouldn’t stop you. Qualifications and licenses exist for a reason. Tradespeople shouldn’t have any problem showing you – or with you politely checking their credentials with the local licensing authority. If they do have a problem with this, you may be best to look elsewhere. 6. Get some samples of past work – If you’re getting a new bathroom done, a new parquetry floor put in or something similar, ask to see some examples of the tradesperson’s past work. If you can, tee something up so that you can see their work first hand. 7. Confirm they have public liability insurance - Most trades involve a bit of risk, and accidents can happen no matter how careful or skillful a tradesperson is. Ensuring that the tradespeople you employ have public liability insurance means that they'll be adequately covered in case they they cause any damage to your property or injure anyone. 8. Ask for references – This is important for big building and renovation jobs. If you’re trusting someone with your life savings (and overdraft), make sure you get some genuine references from past clients who are willing to vouch for your builder in writing. Ask them how much they went over their original budget. 9. Get the right tradesperson for the brand – If you’re having something fixed or serviced (like a hot water unit, for example), you’ll probably void your warranty if the tradesperson you’re choosing isn’t officially authorised to service it. For any service job, contact the installer or manufacturer and ask them to recommend a trusted tradesperson. Tradie / client relationships are a two way street. If you’re not properly prepared, it’ll cost you more, frustrate the people you’re hiring and may unnecessarily sour the whole experience. 1. Give a detailed briefing – Make sure you’re as clear and detailed as possible about the work that needs to be done when you’re getting a quote. If you’re thinking of particular fittings, colours, sizes or brands make sure you communicate this before a contract’s signed. Don’t be frightened to send a detailed scope of works to be done on an email – this is as good a discipline for you as it is for the tradie from a costing perspective. 2. Be sure about what you want – If you change your mind about something when work’s already started or you ask for variations to the contract, expect to pay much more for it! Some tradies make a living out of initially costing low and charging exorbitant amounts for variations because they know the customer will change their mind during the project. 3. 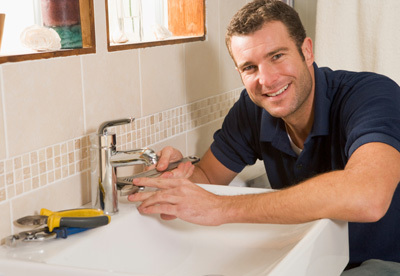 Consider any other work you need done – Getting a plumber in? Get him to fix your leaky taps and check the sacrificial anode in your hot water service while he’s there. This will save you the expense of another callout. Good luck – it’s an inexact science! Looking for good tradies? Visit our Service Central Get Quotes page to get 3 free quotes from reputable tradies in your area.All of the tradespeople on Service Central are fully registered, insured and qualified, and are subject to strict quality criteria and ongoing compliance checks.